The Casio PX-750 is a digital grand piano with an 88-note scaled hammer action tri-sensor keyboard. The keyboard features 250 built-in tones with dual and layer functions. It has three pedals in addition to USB MIDI functioning. The exterior features its own stylish storage cabinet with a sliding key cover. Alternate instrument voices such as strings, organs and bass can be utilized for experimenting or recording. The keyboard offers a recording functioning with playback available for learning, practicing and performing. Casio’s Acoustic and Intelligent Resonator as a sound source provides an acoustic realism that cannot be denied. The PX-750’s graded hammer action and realistic ebony and ivory keys provide for comfortable play. The keyboard also offers a touch sensitivity of three levels to allow for a sound experience close to that of an acoustic piano. Improved from other models in Casio’s Privia line, the sound in the PX-750 creates a flawless and powerful machine built for performing with an unmatched realism and rich expression. The keyboard action responds by accounting for the speed of movement of hammers of different size in relation to the velocity at which keys are pressed. The piano features an updated tri-sensor scaled hammer action keyboard including simulated textured ebony and ivory keys. In fact, the PX-750 features one of the best weighted keyboards in this price range. Not always common in a digital piano, the PX-750 has three damper pedals to enhance performing and add to its realistic performance abilities. The built-in pedals also feature half-damper operation with the model’s Damper Resonance and Hammer Response features. The Casio Privia PX-750 contains a number of additional tones from other instrument classes. Split and layer capabilities allow for separate tones and tone layering while duet mode aids in piano instruction. The Casio PX-750 provides realistic audio that relies on its Acoustic and Intelligent Resonator, or AiR, as a sound source. This model is in many ways updated when compared to previous models in the line. Its weighted hammer action provides a key response that is very similar to that of a traditional instrument. The textured ebony and ivory keys as well as touch response make adapting to the digital piano as easy as possible. It features three pedals with half-damper functioning for effortless note sustaining and tackling even intermediate and expert pieces. While easy to coordinate with its environment, the piano’s black shell exterior has been shown to be weak and susceptible to chipping and cracks. Realistic Audio – Using three times the memory of previous models the PX-750 provides a much more natural piano tone along with its Acoustic and Intelligent Resonator sound source. Responsive: The unit responds reliably with weighted hammer action and a sensitivity reminiscent of an acoustic instrument. Touch – The touch sensitivity offers a response similar to that on a grand piano. 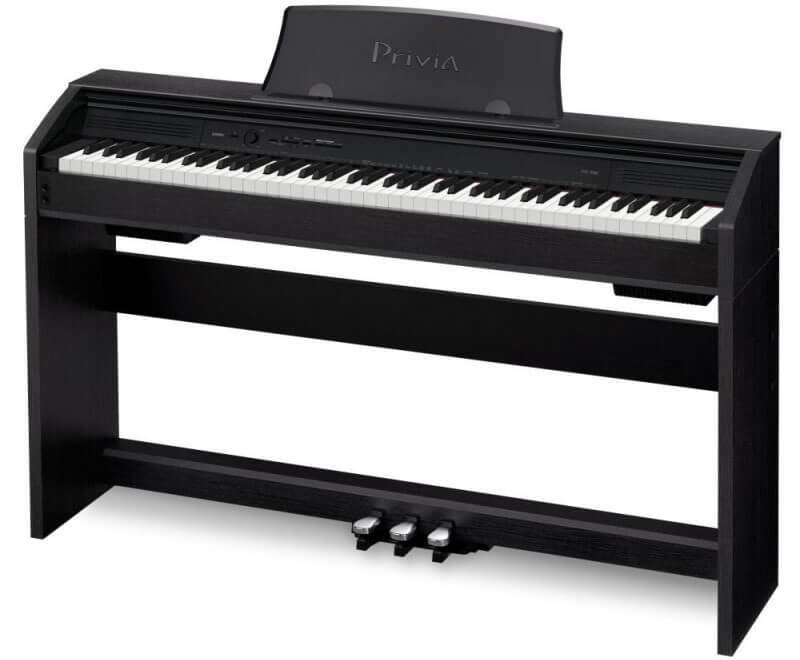 Appearance – The PX-750 digital piano has a clean and sleek black appearance that is simple enough to blend with any surroundings. Pedals – Three damper pedals are built into the keyboard unit with half-damper operation. Less Features – Compared to earlier models, some features in the PX-750 are not available. The PX-750 only provides one memory track and does not provide an indication for the current metronome setting. Exterior – While the piano’s black finish may be esthetically pleasing it is not the most durable. The finish is thin and may chip easily with hard impact. 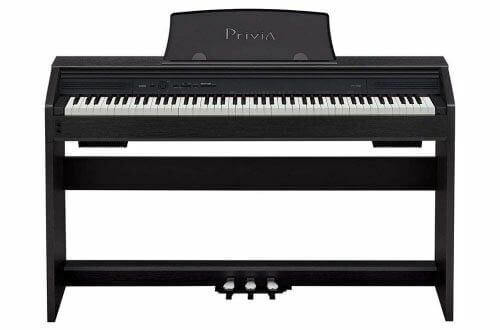 As a whole, the unit is still sturdy compared to other digital pianos that come under $1000. With its versatility the Casio PX-750 offers a range of features for every level of piano player. From its high-quality sound to its spectacularly authentic feel, it is built as a compact yet dependable substitute for a grand piano. It is an excellent choice for those who value performance ability yet need to play in smaller space.